Welcome to our Matched Bets review - A matched betting service that includes Odds Matcher & Acca Backers software as standard with premium membership. Matched betting is a risk free way of making money from the incentives, such as free bets and refund bonuses, that online bookies offer to new and existing customers. It's a strategy that has been around for a long time, but it's still going strong and there are many people that have been able to make a lucrative income from it. Over the years a number of services have become available that are designed to show the ropes to those new to matched betting, but many also offer tools and strategies for those that have already completed the initial offers and want to advance to the next stage. There can be so many offers to complete day to day, that it can be really beneficial to see everything listed in one place. If you are new to matched betting, the service has some really good guides to explain the basic principles and what you'll need to get started. It states that you can get started with as little as £25, but at least £100 would be better. 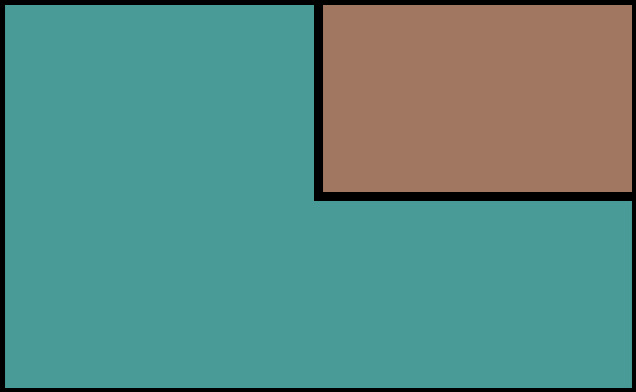 There is a section dedicated to New Customer Offers, which lists all of the available sign up bonuses and instructions for each one. Just by completing the first seven offers listed, you can easily double a £100 bank. At the time of writing this review, there are currently 54 sign up bonuses to work through, so even if you already have a few bookmaker accounts there will be plenty more to make money from. Completing all of the listed offers in this section would give you a guaranteed profit of £1262, which can then be reinvested into completing the existing customer offers. The Existing Customer Offers section lists all of the current offers available, organised by Guaranteed Profit, Risk Free or Potential Profit. They can be filtered by Bookmakers, Profit Type, Offer Type, Sport, Expiry Date and whether you've already started the offer or not. We'll explain more about the offer tracking feature later. Clicking on any of the offers takes you to a page that contains everything you need to know about the offer, including the main terms & conditions and how it works. 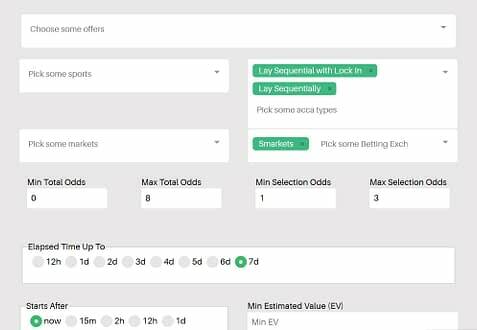 Today is a Tuesday and could be considered one of the quieter days of the week for matched betting, but there is still a guaranteed profit of £61 to be had by completing all of the offers on the list. There are another 25 offers listed that have the potential to make even more money. If you have a big enough bankroll to tackle these offers, you could be looking at a profit of at least £400 a week guaranteed from the regular on-going sportsbook bonuses alone. Update June 2017: Matched Bets have now added a Daily Offer Calendar where you can view reload and sign up offers by day. The Odds Matcher is a key piece of software for matching betting that finds suitable bets for completing offers. It automatically refreshes so you are always looking at the most up to date odds without having to manually refresh it. There are currently 32 bookmakers available to choose from, which we have to say is a bit of a let down as we counted more than 70 available on the Bonus Bagging odds software. Update June 2017: The Odds Matcher now shows odds for Tennis and Golf, as well as Football and Horse Racing. Update Ju​ly 201​8: ​​15 more bookmakers ​added ​to the Odds​ Matcher and other tools. One of our favourite features of the Matched Bets service is the Match Calculator. This allows you to keep track of every bet you have placed and every offer that you are working through or that has been completed. This saves a lot of effort as you don't need to waste time filling out spreadsheets to keep track of your bets and profits. 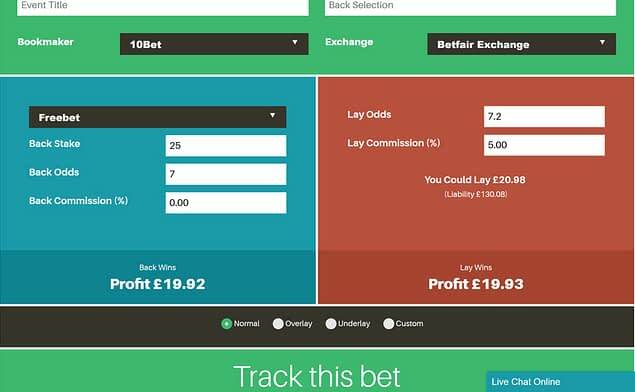 The calculator works out the back and lay stakes that you need to place at the bookmaker and exchange and has some more advanced features such as underlaying or overlaying. You can also choose from nine different types of bet, including free bet on win/loss or enhanced odds as free bets. The Acca Backers tool is a fairly new feature that has been added to the site that aims to make light work of completing accumulator refund offers where bookies give you a refund if one leg lets you down. There are other services out there that offer similar tools, but you usually have to pay an extra subscription fee for it. There's no added charge here - the Acca Backers tool and everything else in this review is included with the standard membership. There are four strategies that you can use with the tool - Lay Sequential, Lay at Start, Lay with Lock In and No Lay. There is potential to make money with all of them, but they each have a different level of risk. The No Lay strategy is the highest risk strategy but would give a better return in the long run. Using the filter button, you can select which strategies you want to use and choose from some other settings as shown below. The software will then run a search and find ten suitable accas. We ran a quick search and the first result that came up had an estimated value of £10.18 from a £50 stake, which is a great return. A lot of these offers can be completed once per day and there are currently 14 bookies to choose from on the software, so there is some good money to be made. Just be aware that if you are going to attempt several accas at the same time using a laying strategy, you will need to keep an eye on the bankroll required. The acca below needs a bank of £214.03. The software is still in beta (in development) and we would like to see a wider choice of bookmakers to choose from in the future, as this is one of the areas the tool is lacking in comparison with it's competitors. The thought of putting money into an online casino may seem risky to some people, but there are tons of risk free offers available, many where you don't even need to deposit any money. The Casino Offers/Bingo Offers pages are presented in the same way as the sportsbook offers and orders the bonuses by whether they are Risk Free, Guaranteed Profit or have a Potential Profit (various risk levels). It's definitely worth working through these as there's the chance of making some easy risk free money, but also you never know, you might get really lucky and hit a jackpot. Clicking on an offer leads to a page with more instructions on how to complete it and there are also guides available explaining the best ways to complete casino/bingo offers in general. Support is available via email or live chat from 8.00am until evening every day. There is also a forum where you can chat about various offers and other matched betting topics with other Matched Bets members. This doesn't seem to be overly active at the moment, but it is updated regularly with threads discussing the latest offers. There is a 14 day trial available for just £1, which is a great way to get started if you haven't dabbled in matched betting before. Premium membership costs either £15 per month or £149 per year. You could easily earn enough to cover a years subscription within the first couple of weeks, so it really is a no-brainer. Matched Bets offers excellent value for money with the Odds Matcher and Acca Backers software included as standard with premium membership. Similar accumulator software would set you back £100-£150 on it's own, so this really is a bargain. We would like to see more bookies added to both software in the future as this is where the service is falling short against competitors. Whether you're new to matched betting or not, the service offers something for everyone. It's an easy money maker and we are happy to award a pass.